I'm looking for some feedback here please. According to the attached parts diagram, the pillion footrest bracket is attached by a bolt through from the inside, into the footrest hanger. I've not yet found an online manual showing the silencer mount. Now, my SSD has been fitted up with 10mm through bolts / nuts, attaching both footrest brackets and the silencers to the footrest hangers. The corresponding page shows part 18 to be a 7/16 x 20 set screw. My question concerns how the silencer should be attached to this bracket? Does it use another 7/16 x 20 set screw, entered from the outside, short enough not to bottom? My temptation is to use one long 7/16 x 20 bolt, right through the whole lot with a nyloc nut on the end. Your ideas / thoughts/ comments on how it was originally fixed would be welcome. 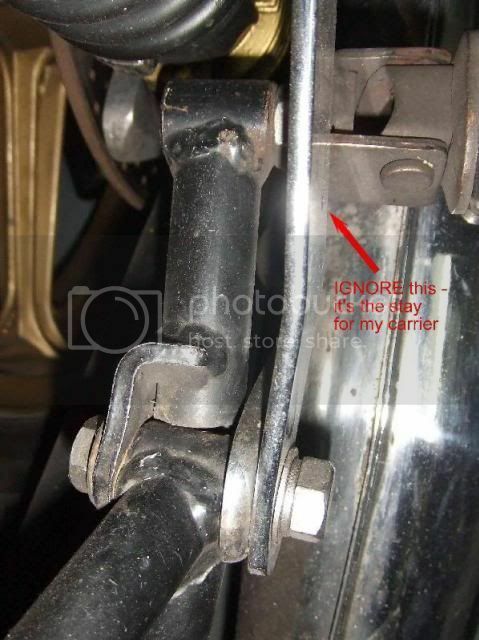 ColinS wrote: My question concerns how the silencer should be attached to this bracket? Does it use another 7/16 x 20 set screw, entered from the outside, short enough not to bottom? Yes. On the basis that "A picture's worth a thousand ..." (left side, btw, looking from front towards the back). I think I'll proceed with set screw entered from each side, makes it easier to dismantle one piece at a time. FYI, my bike has Conti reps. and a 3/4" - 1" spacer between the silencer bracket and the footrest hanger so the screw will be a bit longer than in Craig's photo. Steve, that's a large bolt/screw at 7/6". Pics attached. Please ignore the red discolouration, it's a reflection of the cover on the adjacent bike.